It’s time for some JohnnieFromTheBlog Apple product predictions. Last time I wrote about iPhone 4s in this prediction article. 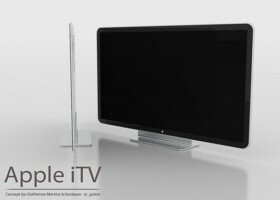 This time I want to talk about the rumored Apple iTV television set. Now keep in mind, even though I do have some reliable sources here and there, most of this article is pure speculation. I think we will most likely see two models, either a 40- and a 50-inch or a 42- and a 55-inch. Both models will have the most recent Apple TV media device built in and obviously run iOS. Apps and add-ons will be downloadable from appstore, and some existing iPhone and iPad features such as Siri will be included out of the box. The hardware will be powered by an Apple A6 quad core processor from TSMC, and except for features such as wifi and Bluetooth it will have 64 or 128 GB of flash storage. The internal storage will mostly be used for downloaded apps and such, but also for media caching. Now as for panel technology, rumors point towards OLED which I don’t think will be the case. Instead I think we will see a 4K QFHD backlit LED panel with the resolution of 3840×2160. This panel will still be extremely thin and lightweight even if it is not as thin as OLED. It will also have a 2-lens 8MP iSight camera integrated which except for FaceTime and such will be used for remote less gesture control making you able to pull down menus, using apps, browse photos and music all with just hand gestures in the air from your couch. Further I expect nothing less then full integration with MacOS/iTunes, iPhone, iPad and iPod. I am assuming we will be paying a premium price at somewhere around €3000-€6000, but I truly believe it will bring value for the money. Oh, and the picture above is obviously a concept picture.